In the late 1970s, when the world was all set to enter the age of nformation and communication, Nepal was creeping towards political awakening. Not only the activities of political parties were banned then, but any individual endeavors aimed at raising awareness among public was discouraged. In fact, the then rulers would arrest and torture anybody they suspected of going against the Panchayat- the existing system. In those times, it was a brave decision for a young boy - with a fervor for music - from the eastern district of Dhankuta to join the political activism at grass root level through music. Oblivious of his own career and immediate consequences that he could face, Shambhu Rai - now a very popular singer, traveled with his like-minded friends from one village to another of the eastern hilly districts, singing songs of social and political awakening. As the 'band' that included Rai's co-travelers Ramesh, Manjul, J. B. Tuhure and Arib Shrestha sang songs like 'Manis chhut achhut hunchha ma bhandai bhandina, Jati ra pati chhutyaune gitlai ma mandai mandina' (I do not believe that men are either touchable or untouchables, I do not agree with the songs that discriminate castes) Rai still recalls the hospitality shown by the villagers, save the representatives of Panchayat system and some feudalistic people, during their travel. "The people in those villages still remember us," said Rai. "They treat us the same way they did 25 years back and we feel extremely elated by that. " "Actually, this warm love and respect shown by the people is the greatest souvenir of my musical career," Rai speaks out his sentiments. Before and after this transition, Rai's life has seen two extremes. In his childhood, he was a typical village boy whose priority was to assist his parents in their day-to-day chores. Honing his natural flair or pursuing his interests was not one of the concerns, not of any of the village children. He would, however, participate in the traditional rituals common in his culture and village that involved a lot of singing. And it was at such instances, that his extraordinary talent for singing would be noticed. Impressed by his melodious voice, others would urge him to pursue a career in music. But, for a village boy, whose horizon was limited to the little village and sometimes up to the city of Dharan to ferry salts and other provisions, pursuing a 'career' meant very vague. He did nothing more than nurture a dream to be famous, until he met senior artistes like Ramesh and Manjul who took him to the villages to their trip of awakening songs. The group of Ramesh and Manjul was already popular as 'Ralpha' group as they had traveled on similar missions earlier. After some years of traveling and singing people's songs, Shambhu Rai felt an urge to do more. He had become popular among the rural folks of the eastern region, but pursuing the modus operandi involved risk of being arrested and ending up in jail. He made his way to Kathmandu and started looking out for opportunities to sing songs. Just then, he got an opportunity to represent 'Krishi Ayojana Sewa Kendra' at the Inter organizational Folk Song Competition. He later joined Radio Nepal as a Sarangi Player. Sarangi is a typical musical instrument usually played only by the 'gandharvas'. Shambhu Rai is probably the first and only sarangi player from non-gandharva community. Amid the tumultuous journey through various contests, jobs, stage programs and foreign trips, Rai managed to establish a recording studio about a decade ago. By then, he was already established as a singer. Whether songs with classical flavor like 'Chitthi Timilai Lekhin Bhanchhu' or songs with folk flavor like 'Chalechha Batas Sustari' all leave a deep imprint on the listener for a long time. Ever since, Rai is busy with his studio paying attention simultaneously to his business as well as creation of new songs and releasing new albums. 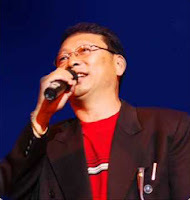 Lately, he has also become very popular as a Radio-program presenter. Not only to the local audience, Rai is equally popular among the Nepali diaspora overseas. He has been called to perform stage programs in various countries. From USA to Gulf countries and from Japan to Germany, Rai recalls how he performed musical programs amid a large cheering mass.